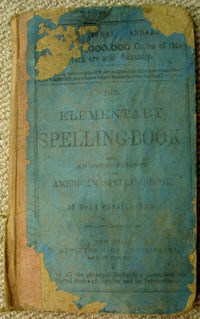 A lowercase “x” at the beginning of a call number indicates x collection; “Szath”, Szathmary collection, etc. A lower case “f” indicates a folio (or oversized book), the last numbers are the year of publication. The examples below are listed (for the most part) by date of publication. 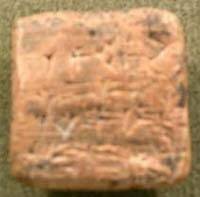 Notes: Modern facsimile of a clay tablet; with reed stylus. 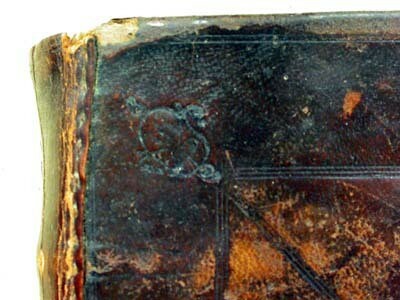 Imprint: Albert of Padua. Sermons – Postillae. Notes: Textblock is half parchment, half paper. Rebound with protective wrapper by Pamela Spitmueller. Call Number: MsC 541 (Medieval Mss). Imprint: Pio Antonio Olivieri. Papal Manuscript. Imprint: Cicero. Doubtful and Spurious Works. Ad Herennium Libri IV. 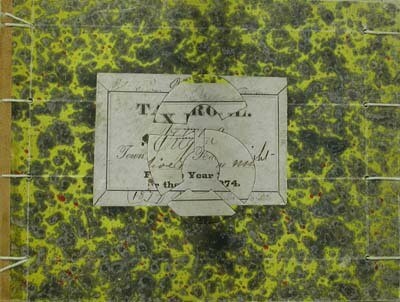 Notes: Item can only be handled by Conservation or Special Collections staff at this time. Imprint: Lucanus, Marcus Annaeus. Pharsalia. Structure: Manuscript appears to have been prepared for the heavy marginal annotation present in the first half. Notes: Full calf over wooden boards. Sewing is largely broken, which expose remains of sewing on four split (tawed) thongs. Imprint: Rolevink, Werner. Fasciculus. Venice: Ratdolt, 1484. Structure: Semi-limp paper boards. 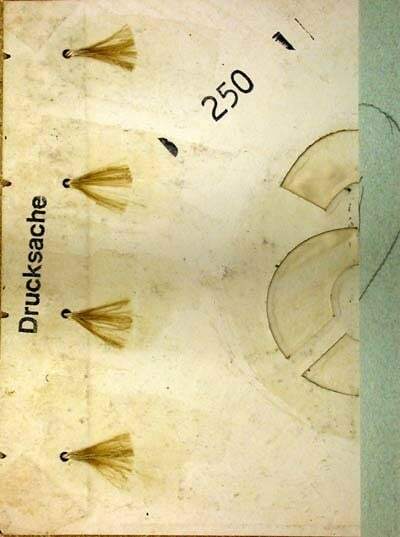 Pastepaper cover. Notes: Sewn on four thongs, full blindstamped pigskin. 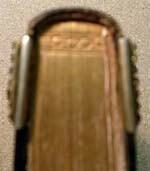 Brass foreedge clasps. Imprint: Catholic Church. [Ces presentes heures a lusaig de Tour au long sans requerir.n.p., n.d.]? Text: On each page text is surrounded by woodcut border with images and decorations. Partially rubricated in red and blue. Structure: Parts of an earlier [18th Century (?)] 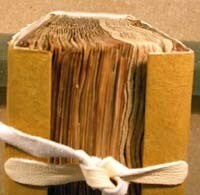 rebinding, laced. 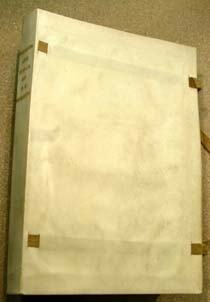 1/4 sprinkled sheep with brushed paste paper covers, hidden vellum cornrer, has been preserved in accompanying box. Size: 110x180mm. 135 leaves (counted in pencil during rebinding). Notes: Recently rebound in alum tawed pigskin. 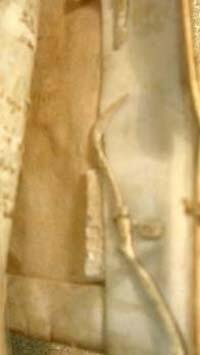 Sewn on four double thongs laced into wood boards; endbands sewn into head and foot cap; brass and tawed leather clasp. 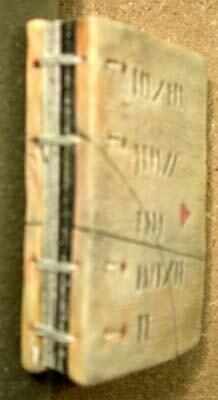 Boards from earlier binding (18th century?) laid into phase box. Imprint: Terence. Terentius in Suametra Restitutus. Florence: P. Junta, 1505. Text: Italic letter. Not paged but signatures signed. Half title page, colophon. Some marginal notes including a pointing finger. 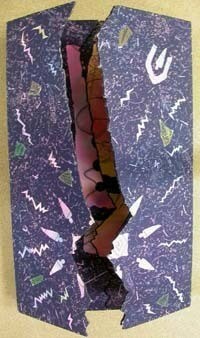 Structure: Block sewn on four cords; vellum over boards; marbled paper endsheets; edges sprinkled red. Endbands. 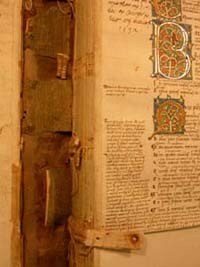 Imprint: Brusoni, Lucio Domizio L. Domitii Brusonii … Facetiarvm exemplorvmq. libri VII. [Romae, Impressum per Iacobum Mazochium, 1518]. Text: Woodcut border surrounding title pape. Structure: Sewn on three leather double thongs laced into cover; endbands sewn on leather strips. 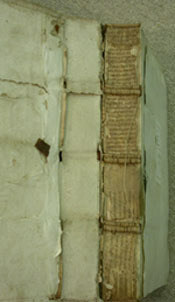 Vellum manuscript fragments used to line spine. Full semi-limp paper cover. 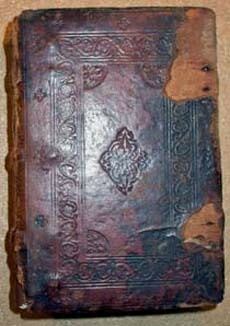 Size: 220x300m, about 450 pages..
Notes: Partial title in an early hand on the lower edgue. Foliated (223 leaves). Colophon with register of signatures. A few marginal notes. In custom dropspine box. Imprint: Epictetus. Arrianou Eriktetos [i.e. Epiktetos] = Arrianou Eriktetos. 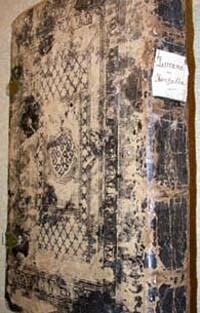 Call Number: xBX1780 .V4 1544Imprint:Verrati, Giovanni Maria, 1490-1563. Dispvtationes adversvs Lvtheranos per diuinarum Scrip. theoremata eorum dogmatibus opposita / Ioan.Venetiis: Per cominvm de Tridino Montisferrati, 1544. Structure: Alum-tawed split thongs laced into 1/4 sawn boards. 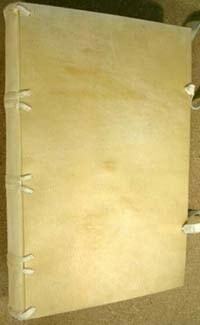 Notes: Blind tooled calf over boards.Vellum titlepiece on spine. Dropspine box. Imprint: Gmara, Francisco Lpez de, 1510-1560. Historia di Don Ferdinando Cortes, marchese della Valle, capitano valorosissimo, con le sve maraviglIn. Venetia, Per Francesco Lorenzini de Turino, MDLX . Structure: Tacket Binding. Vellum wrapper unattached. 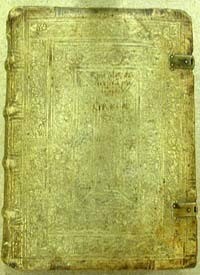 16th Century Italian vellum case binding. Notes: Heavy paper laid over spine. Inked spine title. 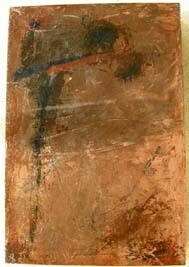 Imprint: Hermogenes, 2nd cent. De dicendi generibvs siue formis orationum libri II. Latinitate donati, & scholis explicati atque il[Argentorati]. Excudebat Iosias. Rihelius, MDLXXI. Text: Woodcut on title page. Notes: Sewn on split thongs. Covered with calf. Blind medallion stamp centerd on boards. Author’s name in ink on foreedge. 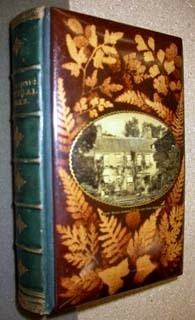 Paper titlepiece on spine. Dropspine box. Imprint: Coornhert, D. V. (Dirk Volkertszoon), 1522-1590. Proeve. 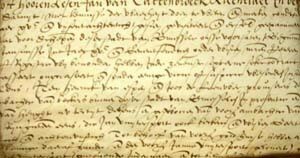 Vande Nederlantsche catechismo omme to verstaen. Of die voort gecome is wte Godlcke schrift. 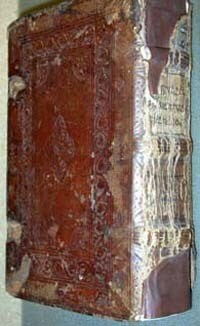 Structure: Late 16th Century Dutch binding. 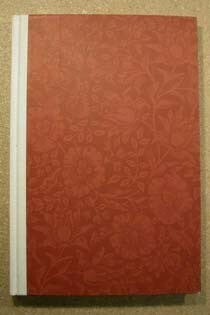 Cover is a vellum document with text on inner side of the sheet, outer side blank. 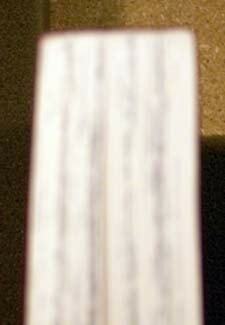 Library shelf mark on spine..
Notes: Sewing exposed on spine; covered with paper. Dropspine box. Structure: Green vellum over boards with with yapp edges. Imprint: Ein Geistlich Lustgärtlein,darinnen vil schöne, liebliche, wolriechende, kräfftige, unnd hailsame Blümlein zu finden ; für eines jeden Christen-menschens Seel unnd Leib, in jeder Noth und Anliegen, sehr nützlich zugebrauchen. Auss welchen Blümlein ein jede Person, soviel siebegert, zu einem Trost in Gott, und Erquickung in Christo dem Herren, abbrechen unnd brauchen mag Gräz, G. Widmanstetter, 1610. Structure: Jewelled Binding. Full black morocco over thin wooden boards. Clasps, catchplates. Cornerpieces and medallions. Decorated with garnets. Notes: Gauffering on edges. Cutom quarter leather dropspine box. Structure: Braided cord supports laced into boards. Full calf. Notes: Full blindstamped calf. Long ribbon ties at foreedge. Custom dropspine box. Imprint: Capra, Domenico. Il vero riparo, il facile, il natvrale per ouuiare, o rimediare ogni corrosione, e ruina di fiume. Bologna, Per G. Monti, 1685. Notes: Covered in semi-limp paper. Imprint: Stapleton, Thomas, 1535-1598. Promptuarium catholicum : ad instructionem concionatorum contra nostri temporisColoniae Agrippinae. [ Cologne]: in officina Birckmannica, sumptibus A. Mylii, 1694. 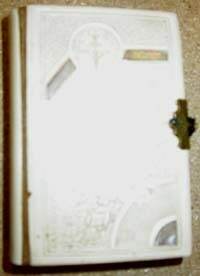 Structure: German Semi-Rigid Vellum Binding, late 16th century. 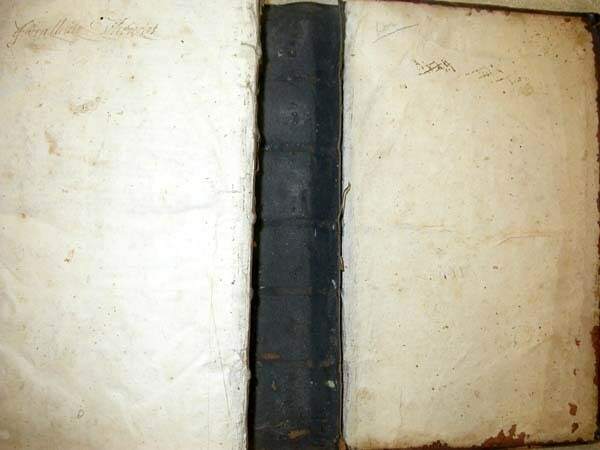 Notes: Scaps of vellum manuscript and marbled paper used to line spine. Call Number: xfBX7630 .S5 1774?/1823? Imprint: Sewel, William, 1653-1720. The history of the rise, increase, and progress, of the Christian people called Quakers: intermixed. Philadelphia: Printed and sold by Samuel Keimer in Second street. MDCCXXVIII. 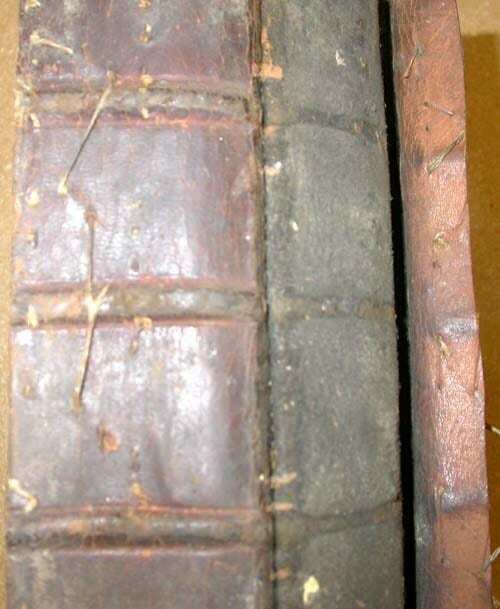 Structure: Early 18th Century colonial American binding. Call Number: HHC fQA35. P76 SPEC HHC QC151 .R5 1739Imprint: Riva, Lodovico, 1698-1746. Annotazioni di Lodovico Riva … al Trattato del moto e della misura delle acque correnti. Bologna: Per Lelio dalla Volpe, 1739. Structure: Laced case construction, hollow back. Notes: Borders painted red and gold stamped with rolls and tools. Structure: Tape-Slotted/Non-Sewn structure. 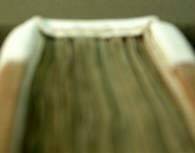 Spine is muslin; boards are a pulped board. Notes: Typical school book for this period. 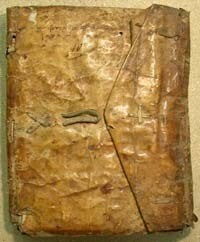 Notes: Mauchline binding. 3-dimensional fern designs over wooden boards with oval photographic image, gilt cartouche, on each board. Imprint: William Morris. Floire et Jeanne (Of King Florus and the Fair Jehane). Kelmscott Press, 1893. 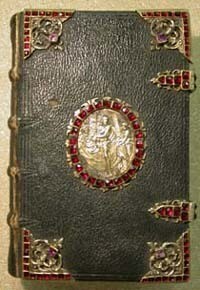 Notes: Jeweled binding. Custom quarter leather box. 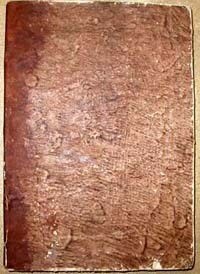 Imprint: Rossetti, Dante Gabriel. Sonnets & Lyrical Poems. Kelmscott Press, 1894. Notes: Limp vellum, sewn on tapes. Call Number: No call number. 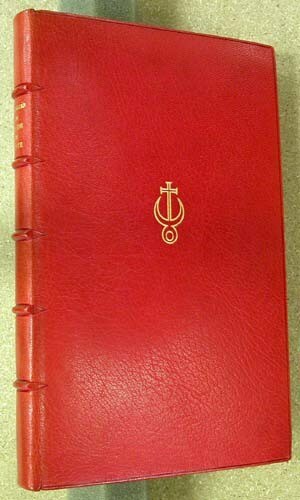 Imprint: The Catholic’s Pocket Manual, or Guide to Jesus. John Bapt: Steinbrener, Wintenberg, 1899. 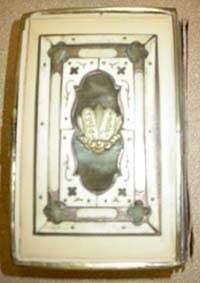 Structure: Celloloid spine and covers with inlaid mother of pearl. Notes: Gift of Charlotte Smith. Imprint: Feast of the New Year. 1906. Notes: Czechosolvakian binding circa 1926. 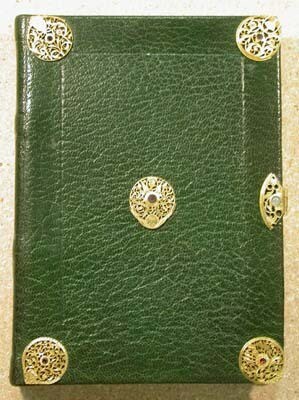 Celluloid covers, brass edging and clasp. 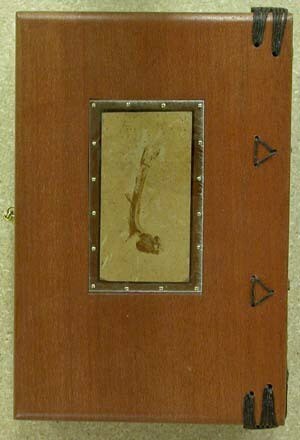 Front cover decorated with velvet, brass, and bone. Repaired with duct tape. Imprint: Morris, William. A Note by William Morris… Grolier Club, 1996. Notes: Quarter cloth with printed paper boards. Notes: No structure, but interesting enclosure. Imprint: Scobey, Patricia. The Back of Time. 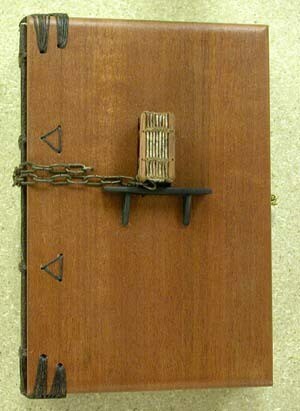 Structure: ‘French Door’ Wire Edge Binding. Imprint: Stahlecker, Bonnie. Marking Time.